English ID: flyer with solid white background. (right column) Editor de Diseno, Director Editorial, Editor de Fotografia, Editor de Arte Creativo/Colaborador, Editor Web ¡Y MAS! (1) Landscape of desert with sun setting in the far background. (2) Poster with a background of transparent dark complexion-colored hands signing “draw.” The hands are overlapped by an image of a transparent postcard sized card with a partially completed tracing of an eagle spreading its wings on the left edge of the card. (4) With opacity blue background, displays an image of a measuring glass pours over ceviche mixing bowl. D﻿﻿o you wish you could invest in the lives of Latinx Deaf, DeafBlind, Deaf Disabled, Hard of Hearing and Late Deafened Communities? You can! 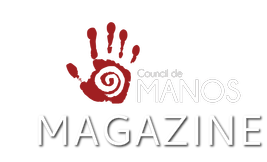 Manos Magazine is completely supported by individual donors. Please donate today.